So, its Second day of the What the Black activity. A Black egg shaped was the first hint. Google says that the Legend holds eating just one of these black eggs can add seven years to one's life. Is the product something related to lifelong use? Black eggs are a kind of known ninja close range weapon. It is also a name for variety of implements and techniques used by ninja.So something related to techiniques? I am trying to think like Sherlock homes! 5. Continue getting hints and ideas: - Through twitter and facebook, trying to get hints from friends and relatives, although they are giving funny comments. 6. Educating myself: - Knowledge about the hints could be useful .Thank you Wikipedia and Google. So what could be the next clue ,or are they trying to distract us?Is the color of the product black ?or does they mean that the product is hidden from the world ? 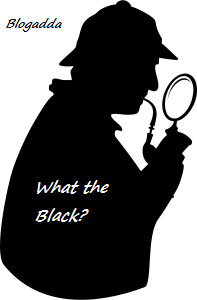 #Whatheblack is trying hard to distract us, So the second clue unveiled is Black newspaper !I am really scratching my brains with the black blank newspaper .What it could be ?Black Egg and Black newspaper. Are they pointing us to early morning? As we have eggs in the morning and read newspaper. 1. Newspaper reading is a personal interest. A Black egg with a chocolate inside and a black newspaper which is blank.I am turning red with this black clues going over my head. Are we humans says Gaza war ? Zen Super Powers you wish for!! I owe it to my religion!! When you invite me for a dinner! !